A true Pittsburgh institution, for twelve glorious years Nick’s Fat City was the place to be for any bona fide rock lover, and it left a mark on the hearts and minds of a generation! A rich treasury of all things rock and roll, Nick's was responsible for introducing a whole slew of incredible bands to the world! 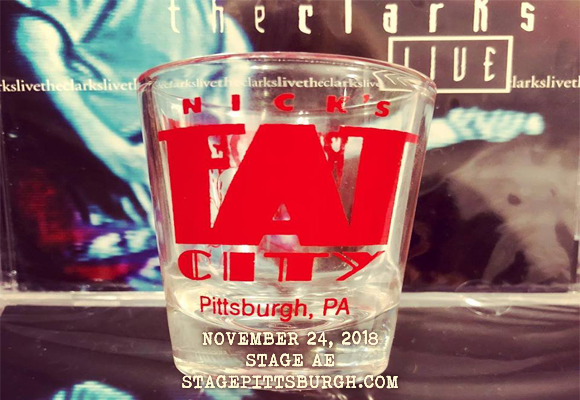 This year, Pittsburgh can revel in nostalgia for the good old days as Nick’s Fat City Reunion 2.0 comes to Stage AE on Saturday 24th November 2018! Headlined by Nick's regulars The Clarks, this is going to be an unforgettable night of good vibes and good memories! Pittsburgh-based rock band The Clarks formed at Indiana University of Pennsylvania when the band's members were at college together. The group formed in the mid-1980s and was originally called the Administration – a covers band that played the music of other bands including the Replacements, the Rave-Ups and Hoodoo Gurus. By the late '80s, the band was writing and performing its own music. Their debut album, I'll Tell You What Man…, was released in 1988 on the local independent label Dahntahn Records. Throughout the group's thirty-plus year career, The Clarks have released eleven studio albums, two live albums, a compilation album, an EP, and four solo releases, selling near a quarter of a million copies in total. The band's eleventh studio album, Madly in Love at the End of the World, was released in June of this year.